Our coaches provide all that is required for your Star Striker to have the best Football Party in town, Mini Footie style. The children will enjoy kicking footballs, playing games, running around using different skills & equipment plus scoring goals before Full Time. Above all, they will all be having fun!! At the end of the party, the medal ceremony will take place, a great photo opportunity. The Birthday child will be presented with a Mini Footie ‘Star Striker’ Trophy and all the children will each receive a Mini Footie medal to wear and take home at the end of the session. Plus certificates to celebrate their participation in a Mini Footie Football Academy session. All proved to be great treasured items for the children to show for their achievements, plus, helps towards those all important party bag treats! 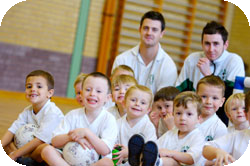 ▶ 2 Mini Footie football coaches for 1 hour. (Coaches will provide all equipment). ▶ 1 Mini Footie ‘Star Striker’ Trophy Cup for Birthday child. ▶ 20 Mini Footie Medals for all the children. ▶ 20 Certificates for each of the children. We recommend 20 children in each party, however, if you have more children attending additional charges will apply for medals and extra coaches. All parties are held at The Chase Sports & Fitness Centre, Prittlewell Chase, Westcliff on Sea on Sunday’s. Dates are booked quickly so we strongly advise when you know your date to contact us immediately for availability. To receive your free Party information pack, please fill in the form below.